Multicultural Expo Celebrates Diversity – AMS Inc. 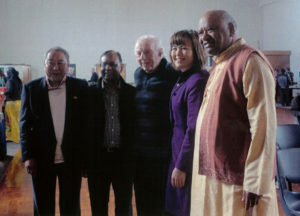 In welcoming participants from many cultures as well as guests and friends of the Auckland Multicultural Society at the opening of the annual Multicultural Expo, the President Mr Thuten Kesang said this was a time to celebrate and share experiences.The event, the fifth held at the Mt Eden War Memorial Hall on 4th August attracted many supporters of the groups who displayed their organizations and activities as well as the general public. The theme for this year’s event, said Thuten was Traditional Music and Costumes of ethnic groups which have made Auckland their home. The groups, most of whom are members of the Society, set up information stalls around the perimeter of the hall, leaving space for families and friends to be seated to enjoy a non-stop three-hour programme by costumed dancers performing their traditional music. Planning of the event and negotiations to bring leaders of cultural groups to take part were in the capable hands of the Society’s treasurer Mrs Ana Maria de Vos, herself a talented and expressive performer. It was a full-on day for her but she had the support of two attractively dressed comperes on stage, Makanaka Tuwe (Zimbabwe) and Rez Ricardo (Kurdish Communty.) Ana Maria also took on the role of meeting guests arriving at the Expo such as Dame Susan Devoy, Race Relations Commissioner and Mr John Palino, mayoral candidate at the forthcoming local body elections.Thuten Kesang welcomed to the stage Melissa Lee, List MP for the National Government who said she was representing Ethnic Affairs Minister Judith Collins, who was unable to attend. Thuten praised Melissa’s support for the work of the Society and in return, she acknowledged the efforts of long-standing committee members who kept the Society active. Commenting on the recently announcement of Labour policy of restricting Asian groups from purchasing multiple homes, the MP said that as the first Korean to gain a place in Parliament, she had lived in Korea for nine years but in New Zealand for 25years. There was no way she should be restricted from buying property, she said, to clapping from the audience. To a small group of those he had met earlier, Melissa said she had recently bought a home but it needed extensive renovation. She was proud of her son Ethan who was training at the West End Rowing Club as an oarsman, his height and fitness being a strong factor in his progress. The Multicultural Expo provided a valuable time for those taking part to interact with people of other cultures and to help understand their thinking and points of view. Throughout the day, the Nathan Homestead from Manurewa kept the children occupied by providing them with games and things to make which was really enjoyed by the children. All the materials were supplied by the Nathan Homestead. 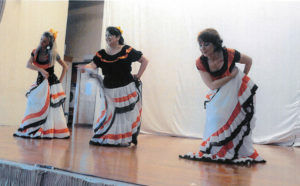 The afternoon was taken up with more than 20 performances by cultural groups appearing in their striking costumes. Displaying a huge bouquet of red roses in the front of the stage, the Bulgarian Roses gave a spirited performance. Some talented young Tamil boy and girl dancers trained at the NZ School of Tamil dance followed. In contrast, dance proponent Rae Storey introduced the English Maypole Dancers from Meadowbank School. Jane Luscombe’s flamboyant Spanish Dancers then took the then took the stage in colourful swirling costumes, followed by the more subdued but pleasant melodies offered by the Ukranian Nation Singing Group. With hardly a break, the graceful French provincial dancers La Burree gave a seasoned performance. To follow were the Sunshine Iranian dancers and then, the Oleksandr Radchenko singers. Providing even more variety to the programme was the Printable Reality team offering a poetry reading and then the highly enthusiastic Auckland Chinese Philharmonic Orchestra took the stage with a soprano soloist. They included their interpretation of the Maori waiata “Po kare kare ana” which was warmly received. Wearing vibrant yellow silk costumes, the Joy International Folk Dancers from Taiwan lived up to their name with wide smiles and graceful movement. A Spanish guitarist duo Richard and Sandy received a big round of applause for their astonishing guitar skills,. The young children of the Philippines Community took a little time to get into the risky rhythm of the jump dance between bamboo poles due to a short recording glitch, but there was strong audience applause. 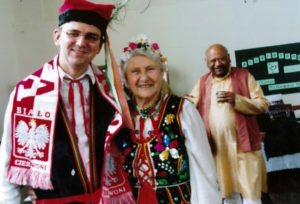 Romania, Dalmatian and Polynesian dances and music provided even more variety. Then the Kurdish community provided a Middle Eastern flavour to the day with a Bangladeshi item to follow.